The concept of congestion pricing springs from three in-your-face statements to New York drivers: (1) You’re not sitting in traffic; you are traffic. (2) You want to clog the streets and spew fumes? Fine, but it’ll cost you. (3) Better subways are your responsibility, too. Pay up. Nobody wants to start paying for an activity that’s always seemed to be free, or pay more for an activity that’s already expensive, so the idea of charging drivers to enter Manhattan below 60th Street instinctively seems outlandish. The toll would tackle two problems simultaneously, thinning traffic on maddeningly sclerotic streets, and at the same time pumping money into a starved transit system. The city needs congestion pricing because without it terrible traffic and the miserable subway will both get worse. They will also get more expensive. Underground delays and time on the road both have costs, borne in money and frustration. It makes sense to shift that burden toward those willing to pay for a faster, smoother drive. Governor Cuomo has come to accept all this (though not without plenty of waiting, waffling, and hints of an impending reversal); Mayor de Blasio has not. State legislators haven’t voted yet, but their reactions to Cuomo’s proposal have generally ranged from the tepid to the hostile. That’s almost tragic. In January, the panel of experts that Cuomo appointed produced a set of proposals called Fix NYC, and lo, they are pretty good. The report includes a dizzying array of options, but the basic recommendations are straightforward: an $11.52 toll on all private cars entering the central business district (defined as Manhattan below 60th Street) and a lower per-ride surcharge on taxis, Ubers, and their ilk. The result: The transit system would reap $1.8 billion a year; weekday traffic in midtown and lower Manhattan would move on average 20 percent faster; and New Yorkers would spend half a million fewer hours every day getting where they need to go. There’s plenty of room for skepticism. Models can be wobbly and assumptions misplaced. App-based services like Uber have changed the dynamic of the streets in the past few years, and some new technology could do so again. But against those potential kinks and growing pains and resentful muttering, we have to weigh the certainties that flow from doing nothing: a slower, poorer, more decrepit city. New York’s difficulties in moving people around are huge and growing, but they are also soluble. The major objections have answers, most of them satisfying. Mayor de Blasio keeps saying that congestion pricing is regressive. It unfairly burdens outer-borough residents, many of them low-income, who have poor access to transit and no option but to drive. Not true. Under the Fix NYC plan, Manhattan residents would shoulder about a third of the cost, with the rest more or less evenly split among the other four boroughs and the suburbs. Fewer than 5,000 low-income outer-borough residents commute to the central business district by car (compared to the 190,000 who use the subway), and the city could subsidize their costs. The most progressive thing you can do for New York is fix public transit. Before I start paying my entry fees to Manhattan or shelling out more for rides, I’d like to know how well and how soon the plan is going to start cutting traffic. We don’t have a crystal ball, but we do have Charles Komanoff’s Balanced Transportation Analyzer, which sounds like it ought to have gears and smoking test tubes but is actually a downloadable spreadsheet that incorporates dozens of different variables. The Fix NYC panel adopted it for their analysis, and it’s a beautiful plaything for a data geek. Want to know how much more slowly cars will be driving through midtown if truck traffic increases by, say, 8 percent in five years? Download the spreadsheet and plug in the numbers. Komanoff’s model predicts that if the state legislature adopted the most effective of the various Fix NYC proposals, the number of vehicles entering the central business district (again, Manhattan below 60th Street) would drop by 12 percent immediately, and by 23 percent over time. Traffic speeds would increase by similar numbers: by 11.2 percent right away and 20 percent once the subway improvements started showing up. Those aren’t radical transformations, but they would definitely be improvements, phased in over years. Making drivers buy a ticket to cross 60th Street seems like a blunt tool. My brother’s a UPS driver who spends his days double-parked all over midtown. I just need to drop our mother off at her physical therapy on 58th Street and then head back to the Bronx. Should we both have to pay the same amount? Ideally, no. Albany can demand that taxis, Ubers, Lyfts, and other for-hire vehicles transmit a stream of GPS data so that the surcharge varies, depending on how long they spend and how many miles they travel within the toll zone. Monitoring private vehicles is another story: Installing the technology could take years and would likely be challenged as a violation of privacy. For now, the best option is binary: Pay to enter, or don’t. I live in lower Manhattan and my garage fees would pay for a spacious house in most parts of the country. You don’t seriously expect me to pay a fee every time I drive home, do you? I absolutely do. It’s part of the cost of maintaining your lifestyle, and it’s also the price of fairness. Otherwise, drivers coming in from Bellerose will be subsidizing your desire to keep a car in Battery Park City. The plan could incorporate refunds and exemptions for, say, the poor and the elderly who travel to Manhattan for medical care — but not for all the innumerable New Yorkers who believe they’re each a special case. The whole point of congestion pricing is moving commuters from cars to public transit. But is it really a good idea to cram more people into the doddering subway system? It’s true that there’s a time lag between imposing tolls and spending them. That’s probably unavoidable, but we need to think in terms of decades. Revenue from congestion pricing will help modernize and speed up public transit, which in turn should get that elbow out of your solar plexus during your morning commute. But not right away. “We could probably modernize the signal system in 15 years, which is a long time if you’re paying tolls tomorrow. If we don’t do it, the system will be in crisis,” says City Councilmember Brad Lander. I get that transit needs to improve, but given the MTA’s awful record, giving the agency more of our money seems like trying to fix a leaky bucket by filling it with water. Yes! New Yorkers deserve to know that public entities are spending their tax money frugally and efficiently. The MTA does keep the trains running (barely) and it is upgrading signals (slowly), but it urgently needs reform. In the meantime, the agency’s failures shouldn’t be allowed to destroy the very program that can help it. If you want to get cars off the streets, then really do it! Manhattan’s streets are precious real estate, so driving down Fifth Avenue should cost a lot more than $11.52. Why not make it $100? The plan’s goal is not to eliminate cars from the streets of New York but to reach a new, more livable equilibrium. That means making it easier for people to walk, bike, or use public transit, without having to rework their entire lives. I’d never waste an afternoon millimetering across Canal Street to the Holland Tunnel when I can take PATH instead. But if traffic miraculously started flowing there, I might start driving again, even if it meant paying for the privilege. Isn’t that the opposite of what congestion pricing advocates want to achieve? Komanoff’s model includes a “bounce-back effect.” As traffic gets lighter, more people decide to drive, nudging the numbers back up —but not all the way. 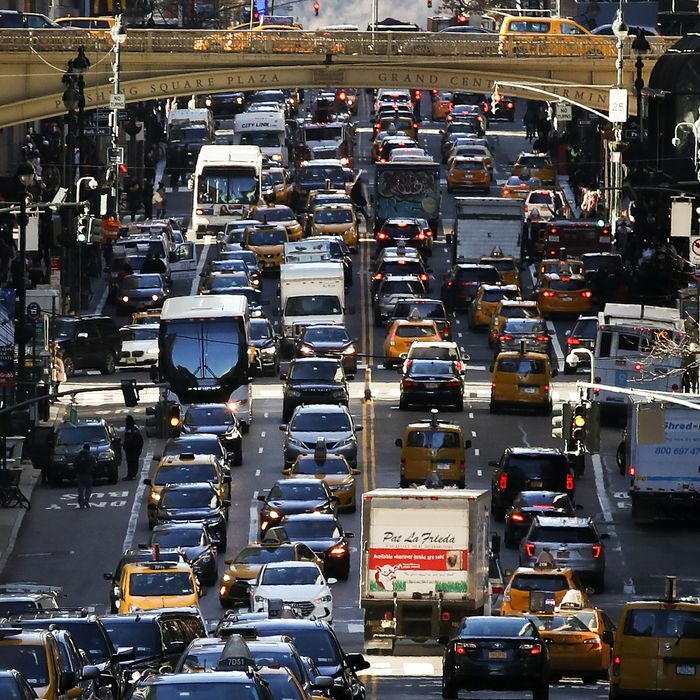 That doesn’t negate the benefits of congestion pricing — it just makes the process take longer. Mayor De Blasio could single-handedly untangle the worst of Manhattan traffic by cracking down on the abuse of city-issued parking placards and on basic traffic violations. Shouldn’t we try that first? It would be more accurate to say that congestion pricing can’t fully succeed without confronting placard abuse and traffic enforcement. But a tolerable urban future should not depend on any one administration’s enforcement priorities: With congestion pricing, traffic reduction gets baked into the system. If congestion pricing does dissuade people from driving into midtown and lower Manhattan, they won’t be paying those exorbitant tolls, and then the subway money won’t materialize. Komanoff’s BTA makes it possible to balance the two goals — reducing traffic and raising revenue — on the fulcrum of price. The beauty of the plan is that his projections don’t have to be 100 percent accurate, since fees, timing, technology, and even the zone’s boundaries can be tweaked. That’s why it’s important to build flexibility into any new legislation. One reason cars move so slowly is that there are so many more pedestrians on the streets; why punish drivers who wait for them to cross? Can we agree that the government can’t set up bouncers on 60th Street to turn foot traffic away, or charge for the use of the sidewalk? The sane way to make traffic flow more smoothly is to regulate vehicles. The insane way is to make New York so badly clogged-up and unappealing that fewer people want to come here. Uber, Lyft, and other app-based services have taken over the streets with their slow-turning, space-hogging Explorers and Suburbans. Wouldn’t it be more effective just to tack on a surcharge for each ride and leave everyone else alone? That sounds good, but it’s really like holding a bake sale to pay for a fighter jet. Adding a few bucks per ride might net $50 million to $100 million a year — pocket change compared to the MTA’s gaping needs — and give up the chance at more far-reaching investment. You can pump all the toll revenue you want into the MTA, but nobody’s going to be building any subway lines in the outer boroughs anytime in the next few generations. How is congestion pricing going to make my commute from Fresh Meadows to Grand Central any quicker? Sure. Congestion pricing could yield both the funds and the political tailwinds for true bus rapid transit. That means running articulated buses in their own, physically separated, inviolable lanes, not just the painted-on kind that police cars and delivery trucks can and do block, forcing buses to nose out into already viscous traffic. Other cities have buses that cover large distances nearly as quickly as subways, and New York could too. Just because we’ve always treated the bus as a third-class transit option doesn’t mean it is one. Fix NYC’s projections depend on the speculation that people will choose not to drive. But who goes on a joyride in midtown anyway? Plumbers’ vans, delivery trucks, black cars: They’re on the streets because they have to be. The entire focus of the debate has been on Manhattan, but there are plenty of outer-borough knots around the city that are equally impassable: downtown Brooklyn, Main Street in Flushing, Fordham Road in the Bronx. Does this plan do anything for them? A little. Some of the vehicles clogging Flatbush Avenue are on their way to Manhattan; as they drop away, the bridge approaches will clear. But there’s a reason the plan centers on midtown and lower Manhattan: That’s the part of the city where people will pay to go. In theory, fewer cars should lower pollution levels, but in London the air quality has actually deteriorated. Has the environmental benefit been overblown? It’s possible. London instituted congestion pricing at a time when supposedly “clean” diesel was on the rise in Europe, a scam that didn’t take hold in the U.S. Leaving cars parked more often will help clean the air, but only as part of a much larger, even-longer-term battle against climate change. And that’s another story.